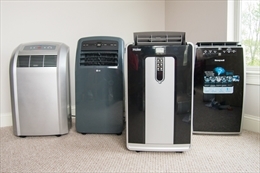 •	The main advantage of portable air conditioner is its portability. Mounted on roller wheels the compact unit can be moved from room to room. But avoid keeping it in rooms that are too dusty. The dust will cause coating over the motor and bring down its efficiency. You will face mechanical and electrical issues. Also be careful about keeping it in too humid rooms. In that case you have to drain the moisture that it absorbs frequently. Consider installing a drain tube so that the excess liquid can be transferred into a bucket. You can empty the bucket one it gets filled. •	The power panel at which you plug your air conditioner should be able to supply at least 120VAC. This will be adequate to start the unit’s fan motors and compressor. Otherwise it may result in blown fuse or shortage. 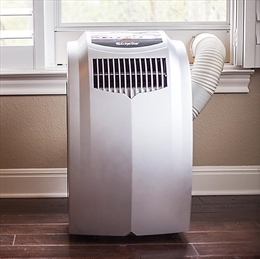 •	All A/c units need regular changing of filters to run at peak efficiency. Regular cleaning will also facilitate you to breathe clean air. Whenever you change the filter of you A/c, do not forget to clean the unit’s pre-filter, usually situated in the upper rear part of the unit. Uncleaned filters will lead to formation thick dust layer on the evaporator coil. It will be unable to transfer heat and will more than likely overheat as a result. If your unit has a carbon filter, change it every three to six months. Use a vacuum cleaner to clean the rear vent of the portable A/c. •	Always ensure that the exhaust hose of the unit is straight. This will prevent the moisture from tricking inside the air conditioner. Moisture inside the unit will result in shorter lifespan. •	If you want to store the unit, do so after drying it properly. Put the ‘fan’ mode on for two hours or so in order to ensure the interior is as dry as possible. Cover the unit with a plastic sheet to prevent accumulation of dirt and dust. Do not keep it in the attic or garage where it will be exposed to insects, heat, and cold. It is always recommended to store it in a closet. •	Clean the condenser coils of the unit if they become covered with grime and gunk. You can use ready-made coil-cleaner. You can also use a home-made solution of water and either lemon juice or vinegar. Spray the mixture onto the coils and let it stay for a few minutes. Clean up after sometime. •	Besides cleaning the interior of the unit, always make you wipe the exterior with a damp cloth. Avoid using chemicals and detergents since they can be abrasive and possibly damage the exterior of your unit. Avoid keeping the unit in direct sunlight as it can lead to discoloration of the housing.